App is very useful. It will make you aware of the incidents around you, provide you with information on what happens in your area, discuss subjects with fellow truck drivers that are of importance to you. No knowledge of computers needed. It is as easy to use tying a text message. No complex menus. It is as simple to use as CB radio! Download the app from either Google or Apple Play store and double click to launch. 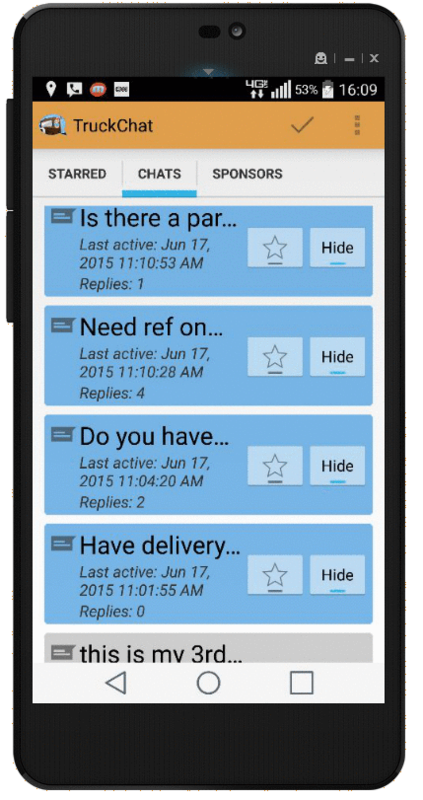 Tap on the pen and write a message, or click on an existing dialogue, or reply to an existing message. It is as simple to use as CB radio! Just tap and start new conversation and respond to existing chat. It is as simple to use as a CB radio! We do not collect emails or ask you to register. Your privacy is fully protected. Please read our most often asked questions. If you have suggestions or do not see an answer to your question please contact us. Do you collect emails or other information about me? No. We are not asking to sign in or reveal your name. We do although asking you to reveal on settings your location so that we know what messages to deliver to you. How far my messages are broadcasted? We constantly adjusting radius of the area. At the start we will have radius of each territory more then 200 miles. If I do not like a conversation on TruckChat can I vote it down? We tried our best to make it easy to use. Will you remove chats that are offensive? If you chat bullies or terribly offend your colleagues truck drivers we will be forced to remove your chat. Can I post job offering or load pick-up in the area? Yes, we encourage our customer to post commercial or non commercial messages. There is no charge. Can I have private chat pers to person? Yes, any participant with green dot in the logo can accept your request to chat. Just press on the logo and and as soon as the other person accepts your chat you will be moved to private area. 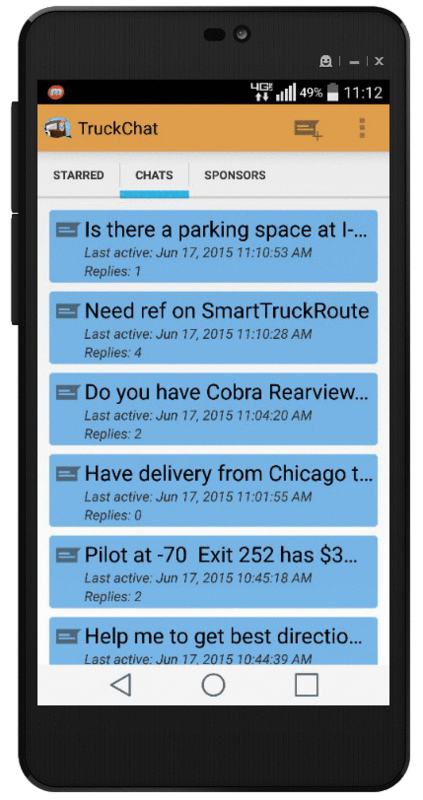 The TruckChat app is ready to use. 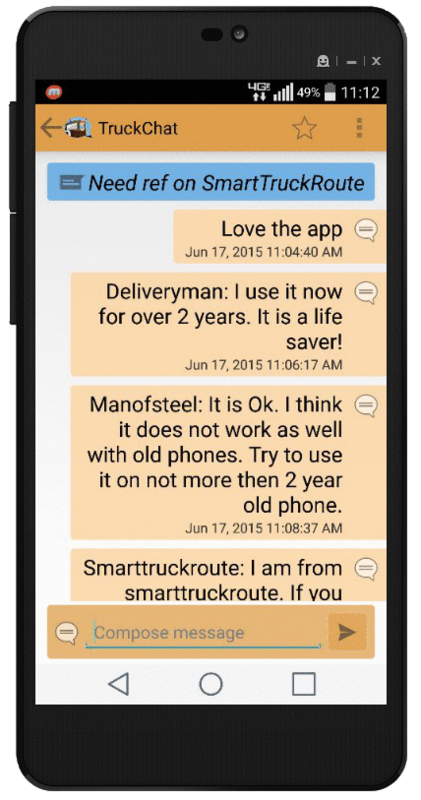 Just download and start chatting with fellow drivers about anything that is related to trucking. 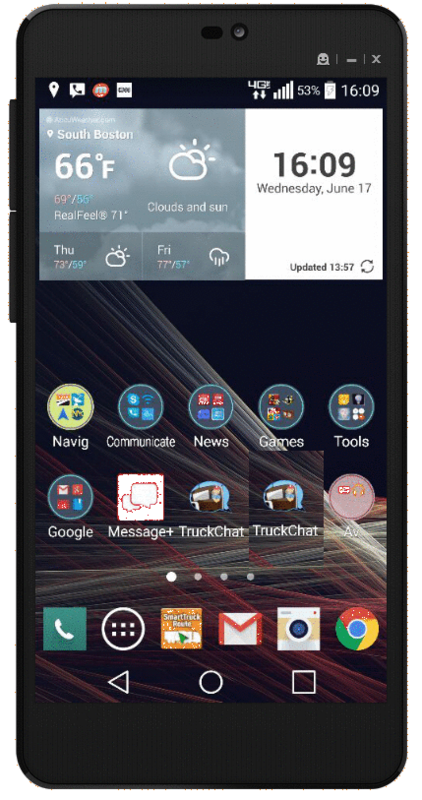 This is a free service provided by TeleType Company, the makers of the WorldNav Truck GPS and SmartTruckRoute truck routing app providing instant truck routes and navigation on smartphones and tablets. Our users include professional drivers, dispatchers, brokers, and service providers such as truck-stops or parts stores that are associated with trucking industries. This chat helped us on a couple of occasions to find drivers willing to pick up a load on a way to their destination. TruckChat shows me what is happening in the area that I am driving in and allows me to chat with fellow drivers. When I have time I like to read and keep track of messages that of my interest. News also are very helpful.